7buruk: The Military Music of the Ottoman Turks. (2) it is the only branch of Turkish music which has exerted any considerable influence on western musical culture. Out of the European imitation "Turkish music" of two centuries ago came the leading percussion instruments and numerous stylistic features of the modern military band, together with similar elements of the opera and symphony orchestra - elements now so much a part of our musical system that their once exotic connotations have long since disappeared. The earliest suggestions as to prototypes of the Ottoman military band are in Chinese references to military instruments acquired by the warriors of Han from their Turkish neighbors in Central Asia, around the beginning of the Christian era. Direct historical allusions appear for the first time in Arabic sources of the Abbassid period, when Turkish soldiers flocked into southwestern Asia as mercenaries of the Caliph and, later, as builders of such Turkish empires as those of the Seljuks and Khwarizmians. With the advent of Jengis Khan, there are significant references to the music, no doubt already of long tradition in central Asia, of the predominantly Turkish armies of the Great Khan and his successors. From the founding of the Ottoman Empire, at the close of the thirteenth century, until the westernization of its armies early in the nineteenth century, the military band was the most characteristic emblem of the authority and magnificence of the Sultan and his generals. Available references to music of the earliest period are meagre, but beginning in the reign of Suleyman the Magnificent (1520-1566) there is a succession of accounts, both Turkish and foreign, which together provide a fair picture of the Ottoman bands. The instruments, especially -their construction, appearance, manner of playing and musical effect- can be described in considerable detail. They included zurna (oboe type, in two sizes), davul (cylindrical drum), zil (cymbals), nakkara (small bowl or kettle drums), kus (large kettle drums), boru (trumpet), and chaghana (stick rattle, simple model of the elaborate European "jingling johnny"). Numerous functions of the bands, ranging from continuous playing during battle to formal concerts, are described, and various customs of administration, training and performance are commented on. Unfortunately, with one exception the authors are historians, diplomats or adventurers rather than musicians; thus there is almost no discussion in technical terms of the actual music performed. In general, the foreign writers are confused by the unfamiliar tonal relationships, the complex rhythmic polyphony, and above all by the overwhelming emphasis on noisy percussion instruments. They usually admit, however, that the total effect is strangely stirring, and they frequently comment on the unifying qualities of the large davul, the characteristic, never-varying "UM-pah" of which eventually became a prominent feature of Western march music. To the Ottoman writers, the mehterhane is obviously less significant as a musical factor than as a military institution stemming from ancient Turkish tradition. In the earlier centuries, when the Ottoman armies were superior to all others, that tradition was an honored one. 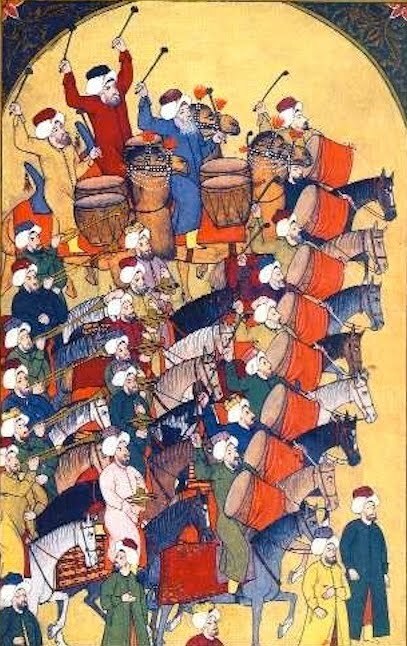 But by the nineteenth century the Turkish soldiery had been far surpassed by European military science, and when, in the 182os, long-delayed Westernization did away with the old institutions, the discredited ancient music of the Khans was replaced by bands in the still-developing European style. Paradoxically, it was important elements of that some style which had first appeared in Western Europe, less than a century before, under the name of "Turkish Music."